The HHF5000 series has been discontinued. Please see the HHF142 as a possible alternative or contact our Flow Engineering department. 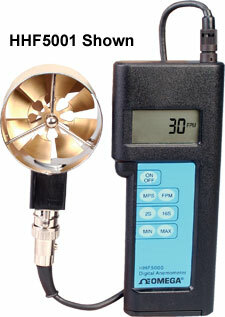 The OMEGA™ HHF5000 digital anemometer enables fast, reliable and accurate readings of air velocity using a high-quality rotating vane sensor with either a 25 mm (1") or 70 mm (2.75") diameter. HHF5000 may be used with either of the OMEGA™ rotating vane sensors. The connected sensor is displayed automatically when the instrument is switched on. The HHF5000 is designed for use in heating and ventilating, air conditioning and process industry applications, as well as maintenance and commissioning requirements, particularly exhaust and fume ventilation assessments. 참고: Comes with operator's manual, vane sensor, extension rods, hard carrying case and batteries.